PHILADELPHIA — The New Jersey Devils were happy to prove they can win away from home. Philadelphia lost its second straight after Tuesday’s 2-1 loss to Florida ended a six-game point streak. 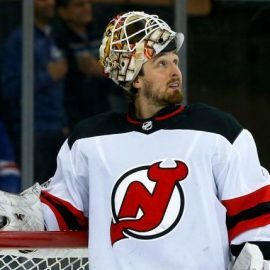 Besides Kinkaid’s strong game, the Devils had fortune on their side. Philadelphia hit the goal post five times and had a goal disallowed. Kinkaid maintained a one-goal lead through the second period when he used his glove to stop Jakub Voracek twice in the final 56.1 seconds. The goalie almost gifted Philadelphia a goal with just over three minutes left when he turned it over from behind the net to Wayne Simmonds right in front. Kinkaid recovered to get his stick on Simmonds’ attempt. The shutout was Kinkaid’s third of the season and seventh of his career. Flyers coach Dave Hakstol said the team would learn more Friday about the extent of Elliott’s injury. Anderson staked New Jersey to a 1-0 lead by finishing a tic-tac-toe passing attack with a hard wrist shot from the slot that got past Elliott’s left pad. A rookie, Anderson recorded his first career goal after pretty assists from Coleman and Brett Seney. The Flyers hit the goal post on four shots and had a goal disallowed in the first. Shayne Gostisbehere‘s apparent equalizer five minutes after Anderson’s goal was nixed due to goalie interference when James van Riemsdyk bumped Kinkaid. The officials’ on-ice call was upheld after a video review. Hakstol said he wasn’t displeased with Philadelphia’s effort. Philadelphia welcomed its big off-season acquisition, van Riemsdyk, back to the ice. The forward had been out since injuring his knee in the second game of the season.